By now, most everyone has viewed the “gumball immigration” video by Roy Beck. And, most everyone has seen the presentation by Roy Beck on “immigration by the numbers” video. Both of these videos while done in 2010 remain pertinent since Congress appears to have little interest in curbing illegal alien invasion and legal immigration. But, what does it mean for our country? According toNew York Times best-selling author and conservative columnist Ann Coulter, it means the extinction of the Republican party without one shot being fired. While some may scoff at Coulter’s predictions, it isn’t difficult to see where she gets her prediction, particularly, if you have viewed the presentations on immigration by Roy Beck. Moreover, with the rampant voter fraud perpetrated against the people by Democrats and States allowing illegal alien invaders to vote, Coulter’s predictions could be spot on. 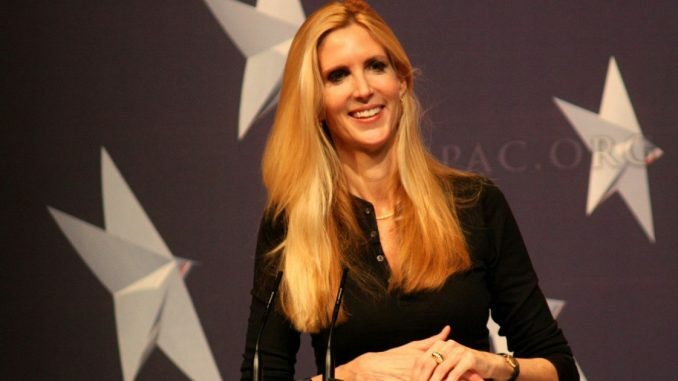 While Coulter blasted Trump’s record on immigration thus far, noting that a border wall still has not been built and the president has yet to sign an executive order ending the country’s anchor baby policy, she also took a shot at “idiot Republicans” who have yet to acknowledge the immigration crisis facing the nation. Anyone paying attention already knows that illegal alien invaders vote Democrat in order to promote the redistribution of wealth from those who provide for themselves to give to those who refuse to work or enter this country to gain access to entitlement programs. This is all by design on the part of Democrats to gain and keep power, essentially ridding the country of the opposition party. Their greed and desire for power all-encompassing power knows no bounds. You can listen to the interview with Ann Coulter below. In other words, in 20 years the Democrats will gain about 1.2 million new voters should only 80% block vote Democrat. Depending on where these 1.2 million new voters are located, the possibility of majority Republican voting States to turn into majority Democratic States is fairly high. Breitbart News further breaks down the immigration issue. Those 15 million new foreign-born voters include about eight million foreign voters who will arrive in the country through the process known as “chain migration,” whereby newly naturalized citizens can bring an unlimited number of foreign relatives to the U.S.
Additionally, congressional districts with large foreign-born populations have become strongholds for Democrats, giving them near electoral dominance. This was most recently evident in the 2018 midterm elections where Orange County, California — a once conservative region of the state — elected all Democrats as the demographics of the county have shifted due to mass immigration. Congressional districts with the largest foreign-born populations in the country, like New York’s 14th District where the foreign population is nearing 50 percent, elected some of the most far-left Democrat candidates, Breitbart News noted. Immigrants, particularly Hispanics and Asians, have policy preferences when it comes to the size and scope of government that are more closely aligned with progressives than with conservatives. As a result, survey data show a two-to-one party identification with Democrats over Republicans. By increasing income inequality and adding to the low-income population (e.g. immigrants and their minor children account for one-fourth of those in poverty and one-third of the uninsured) immigration likely makes all voters more supportive of redistributive policies championed by Democrats to support disadvantaged populations. Democrats like former San Antonio, Texas mayor Julian Castro admit that mass immigration to the U.S. will result in Democrat dominance for generations in swing states. Every year the U.S. admits more than 1.5 million foreign nationals, with the vast majority deriving from chain migration. In 2017, the foreign-born population reached a record high of 44.5 million. By 2023, the Center for Immigration Studies estimates that the legal and illegal immigrant population of the U.S. will make up nearly 15 percent of the entire U.S. population. As someone pointed out in the comments section, it really isn’t just the Republican Party that is in danger, it is the united States as a whole. One can also add Georgia to the list containing Texas, Arizona and Florida since Republican Brian Kemp won by a small margin that could easily be reversed with an influx of illegal alien invaders and legal immigrants voting Democrat. Remember, with the growing number of fringe extreme anti-constitutionalists becoming a “dominant minority”, Democrats throwing off their cloak that disguised them as supporters of the people, and plenty of RINOs in both chambers of Congress, the possibility exists that the united States will be over-run with non-citizens and illegal alien invaders that will be allowed to vote, which can drastically change the government and culture of this established constitutional republic. The Republican Party chooses to remain silent in the face of voter fraud perpetrated by Democrats. Because of that silence, the party is contributing to its own demise. For all their begging of votes to thwart Democrats, the Republican candidates cave time and again to Democrat bullying, abandoning their base and sowing discontent within the voter base. This does not promote Republican voters to turn out to continually vote for those who refuse to back conservative, Christian, constitutional principles. All of this means a move toward more socialist/communist policies that would see massive wealth redistribution, increased injustice through the “justice” system, support of “foreign laws” to be allowed into our “justice” system, increased surveillance and spying on citizens, and criminalization of certain God-given individual unalienable rights. In other words, the united States will transform George Orwell’s 1984 from fiction to reality. All of this could occur before many of us have passed on to meet our Lord and Savior. That brings up another point – the increased marginalization and persecution of Christians. We’ve already witnessed attacks against Christian businesses by the LGBTQrsuv community. Christian symbols and the practice of Christianity in the public square, particularly prayer, is being further eradicated by those who reject moral values and principles. And, much of the Christian leadership – pastors, ministers, and denominational organizations – have remained silent, bowed their heads to the government 501 (c) (3), and refused to stand in solidarity with targeted Christians, Christian businesses, and God. Moreover, the “church” does not appear to support Christian candidates for office. Looking at the state of our country, Khrushchev’s prediction is close to being fulfilled.